As they faced the world’s media, President Trump winked at Russian strongman Vladimir Putin Monday in Helsinki, Finland. Putin seemed to be playing games right from the start by arriving an hour late for the meeting. 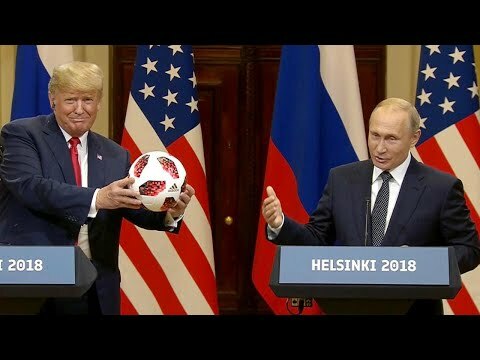 There was one moment of levity when Putin handed Trump a soccer ball. It came after Russia wrapped up hosting the 2018 World Cup. Trump tossed the ball to Melania Trump who was sitting in the front row and said, “This is for Barron.” Barron Trump is reportedly a big soccer fan.